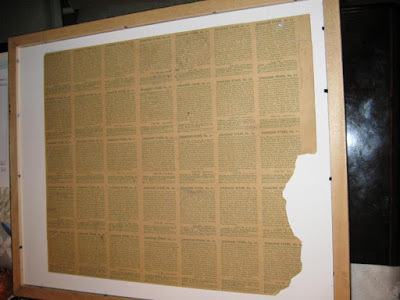 In 2013, a Net54baseball.com collector shared this photo of an uncut test sheet from the middle of National Chicle's 1934-36 "Diamond Stars Gum" set. You can't tell from this side, but it's a classic of both baseball and Art Deco design. Backs comprise #61 to 72. This is the flip of that test sheet, with no printed fronts. 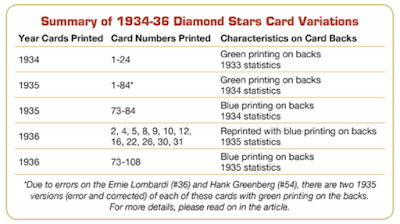 Chicle printed their 108-card Diamond Stars Gum set across three years and this sheet is from 1935. This PSA-created graphic breaks down cards printed in each series. That group of 12 "reprints" in 1936 of earlier numbers supports the notion that each sheet comprised a dozen different players at a time. 1934 started with two sheets, #1-12 and #13-24. 1935 included the next four sheets, #25-36, #37-48, #49-60, and #61-72. Theoretically, test sheets could exist for any 12-player printing, but few paper artifacts survived the Great Depression. The Net54 owner reported this breakdown of his 12-player, 35-card test sheet. It's not known if other sheets with different layouts "balanced" the staggered 1/2/4 numbering for #61-72, but one can argue that limiting some numbers would keep kids buying packs, hunting for numbers not easily found. No law mandated they fill in the gaps or make it easy to finish sets. National Chicle's crosstown rivals Goudey Gum teased collectors in 1933 by leaving #106 out entirely. Buyers eventually realized it didn't exist and complained to Goudey. They created #106 Nap Lajoie in 1934 to fill this gap and "complete" the 1933 set. Today's #61-72 test sheet might not be the final (or only) card arrangement, so we don't know for certain Sam Leslie made it into packs at 1/4 the rate of guys like Ducky Medwick. But it sure seems possible. If so, is Sam more valuable? Not necessarily. 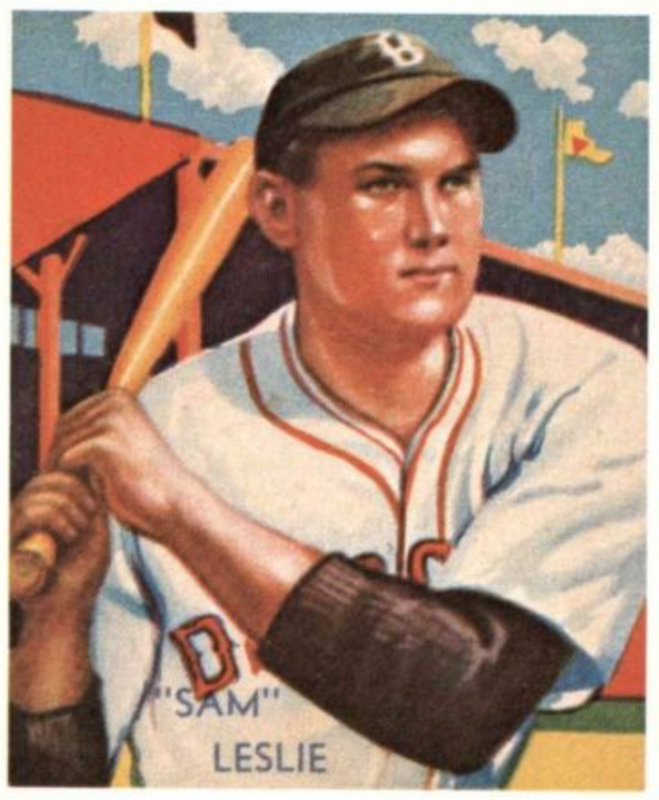 Sam's a common, so proves most valuable for Dodger collectors or as part of a complete set. Price pressure on one 80+ year-old card's controlled by the small number of people working on prewar sets in the first place. Even if Sam's "rarer," modern collectors can find #68 without much hassle on eBay. VALUE: Uncut prewar sheets are nearly unheard of, so value is speculative. Low grade #68 Sam Leslie ranks with the Diamond Stars commons at $5-10. 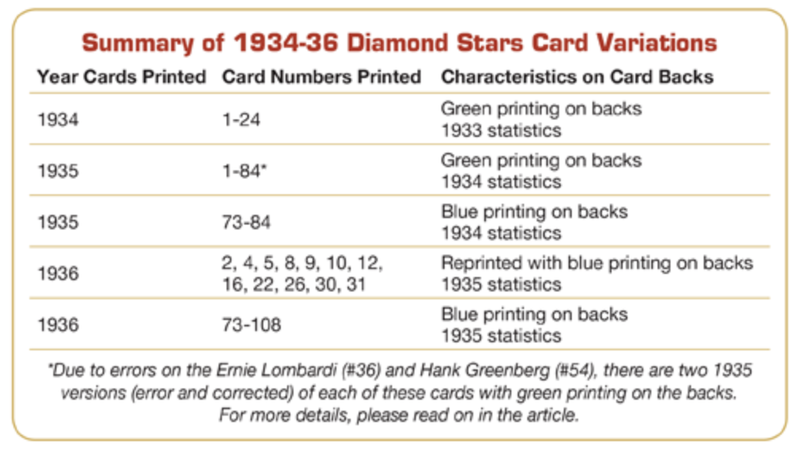 FAKES / REPRINTS: Lots of Diamond Stars reprints exist and I always recommend buying prewar type cards from dealers you trust. 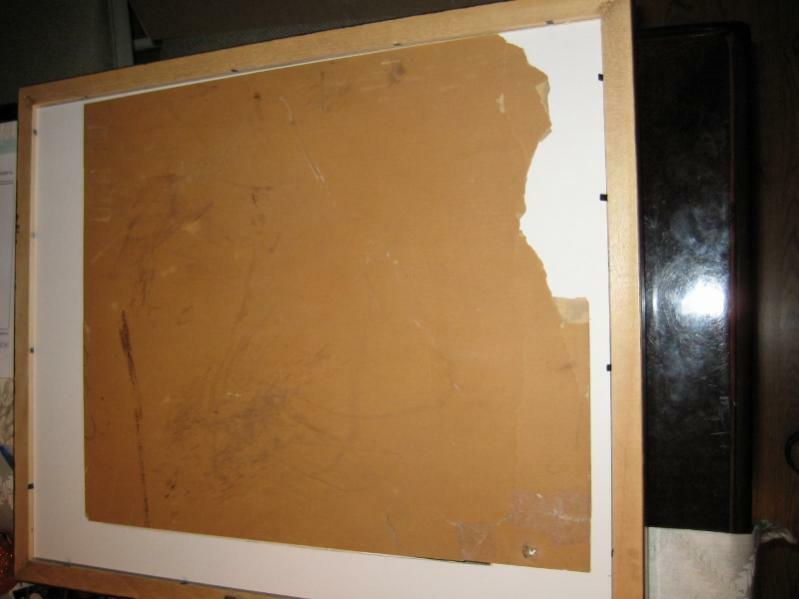 If you plan to make prewar part of your collection, familiarize yourself with the various ways people faked them in the past.